Man-O'-War (n) - a warship powered by sails and equipped with many heavy guns. Brewery (n) - a place where beer, ale, etc. are brewed. That's right! You're looking at a winner! Having arrived in Westport around lunchtime yesterday, my wife and I quickly unpacked the cars, dumped the kids off on my mother and her sisters, and bolted up to Swansea, MA to hear the Yankee Spirits 2009 Home Brew Contest results. It proved to be a harrowing experience. The winners were being announced as part of their 1-4 pm beer tasting, where they had several breweries (20+) offering tastings, as well as a New England Patriots cheerleader signing posters for customers while they stared at her breasts. Or at least that's what I did. To make a long story short we first heard winners were being announced at 2 pm, so we took off and grabbed some lunch and came back just before 2. Walked around, sampled some beers, got impatient, asked again, heard it was happening at 3 pm. I guess we could have waited around another 40 minutes, but we didn't want to taste too much (had to drive about half an hour to get back to Horseneck Beach) and hey - there was ocean, waves, and fun waiting for us. Knowing they'd contact me if I won anything, we left (after purchasing a suitable amount of alcohol for the beach weekend). I was annoyed, a bit. More at having to wait, and sort of wanting to wait longer but not wanting to hang around a liquor store soaking up promotions. In reality, if I had done my homework and called before we went I wouldn't have wasted as much time. Anyway - weekend at the beach is great, it's 4:30 this afternoon - with me heading back up to Boston after dinner while my wife and kids spend the rest of the week on the beach - and my iPhone rings with a number I don't recognize. After the pleasantries, the nice lady on the other end tells me she wishes to congratulate me, as my beer (now called Man O'War IPA thanks to my cousin James) had won Best in Show by a unanimous vote. I was on the porch, in a fairly quiet beach community, and I think I shouted an expletive. Actually, I'm pretty sure I did given the look I got from the neighbors. So there's a $100 gift certificate waiting for my pickup. I'll get it this weekend...and quite possibly spend it! If I can find someone to do so, I may have the beer judged by BJCP regulations just to see how it stacks up. But it doesn't bug me that they didn't use them there. They were just people who know and like beer who wanted to drink some and judge it. And isn't that how you pick the beer you like anyway? Enough crowing. I said when I bottled this one it was a keeper, and it is. I'm shut down from brewing for at least a couple more months, but once I'm moved back to RI and in place, this will be the first recipe I make. First, thanks to Maggie for noting the importance of this day to U.S. and naval history. For the last couple of weeks I've been tossing around the idea of doing a short series of posts concerning the first 60-or-so days of the war leading up to a battle at sea that would shock the mightiest navy then known to the world. And if I feel ambitious, I may just carry on and post about the rest of the naval engagements as the year carries on. Fun as that sounds, it's not quite as ambitious as what Steeljaw Scribe has planned at his place. Which is why I also volunteered to author a couple of posts for him that he'll also put up on the USNI Blog. He calls it guest blogging I call it trying to run with the big dogs as he's lined up some pretty savvy help. For me that's the greater challenge I look forward to. Oh...and I'll post about beer, too. Promise. Haven't brewed much, but I've drank plenty of what I have brewed, and even entered the IPA into a contest based upon the recommendation of my cousin's refined nose (and taste) for the drink of the gods. So I suppose I should at least wrap that recipe up. Like Midway the last few days/weeks, there is plenty to read online about the D-Day Landings online. Just doing a Twitter search for Dday65 will yield a veritable cornucopia of anecdotes and links to stories, videos and pictures that are all amazing to peruse. Or pick one of your favorite MilBlogs and read away. The weather dilemma that Ike faced is no secret. It was bad. Really bad. Go now, or go in two weeks. And if the weather is bad then, your next chance is in the Fall. Ike relied on the meteorological advice of Group Captain Sir James Martin Stagg in moving the invasion from June 5th to June 6th. Ultimately, he decided to go on June 6th counting on Stagg's forecast that the weather would clear shortly following the landings. As it would turn out, the weather on the secondary date would have made an invasion impossible. Pardon the picture...I was dealing with a limited camera, less than ideal lighting, reflections of a plexiglass case, and several glasses of champagne. While this is amazing in and of itself, what made the hair on the back of my neck stand up was a map and a letter I found framed in the hallway. 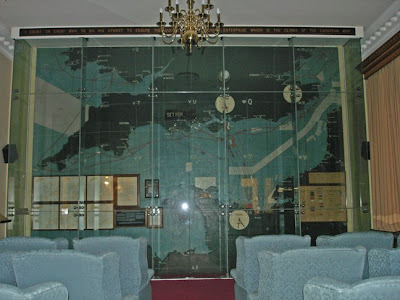 The map was a meteorological map of the England, the Channel and the northern coast of France on 20 June, 1944. 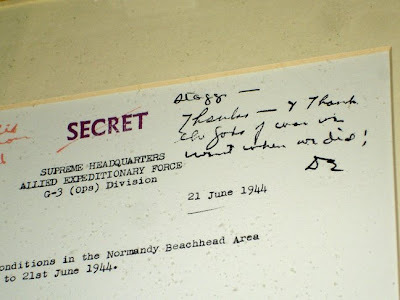 The letter, marked "SECRET" and dated 21 June 1944, was a report from Stagg to Eisenhower detailing current weather conditions in Normandy. In the upper right corner there was some writing. Seconded...thank you, Gods of War. It's been a damned long time since I posted here - it's been a damned long time since I brewed any beer but I'm moving in under two months so I don't need the hassle of gallons of beer to pack and move. So I'm going to take this opportunity to make a small comeback and talk about the "other" topic (and even more neglected than brewing!) of this blog, naval history. On June 4th, the United States Navy observed the 67th anniversary of the Battle of Midway. But I'm not going to write about Midway - at least directly. There is plenty of outstanding information about Midway put out by the Navy and in the Naval Blogosphere this year. Just look here and here for two outstanding examples. The second series was put together by this guy whose blog I read fairly often, and even comment on once in a while. I did, however, participate in a commemoration ceremony in Boston today. You can see some pics of the ceremony and cake cutting here. Two Midway veterans attended the ceremony where they were honored, and afterward I had the chance to speak at length to both of them. The two gentlemen (and their wives) were a pleasure to speak with, and at the same time a study in contrasts in a social situation. One was gregarious, quite extroverted and very willing to share his experiences as a gunner aboard a PBY Catalina at Midway, as well as the rest of his experiences in the Navy. A proud WWII veteran who loved to share photos and memories. The second was definitely more reserved; he moved a little slower, and did not want to speak during the ceremony - I had initially been told that he did not remember much of Midway, so my assumption was that this gentleman may be beginning to suffer from memory loss. It turned out that his hearing is failing, he had developed some speech problems, and he didn't want to run the risk of embarrassing himself or become a distraction. He was a radioman on a cruiser - USS MINNEAPOLIS - during the battle. Both were a pleasure to be around and speak to, and during the ceremony the first gentleman addressed the audience for several minutes (I remember "Pardon me for saying this but...we blew the Hell out of the Japanese there" as a highlight.). In a slightly more private setting, the second gentleman warmed to much of the conversation and began sharing a little bit with us. It was great to see him let his guard down a little and become more engaged, not worrying about his speech issue as the conversation became more friendly. He remembered MINNEAPOLIS, being on the gunnery range on December 7th 1941, 20 miles from Pearl Harbor as the Japanese were attacking and staying at battle stations for 3 full days after, how many men were in the radio shack (too few to man everything they needed to) and a few other experiences. He wasn't very forthcoming about Midway though...I was stumped at how he could not remember anything. Eventually the conversation turned to the all too familiar plight of junior enlisted personnel - having to do things without really knowing what is going on. The first gentleman spoke up "Really, unless you were an admiral, you didn't know what the big picture was." As far as he knew, they were flying around looking for the Japanese because they were told to. He recalled spending long days after the battle flying around looking for downed aviators. He remembered looking at the water, without binoculars, for hours on end, until he thought he was going blind. I believe he then turned to the second and asked, "How about you - where were you?" "We went to our battle stations in radio, which was near the outside of the ship, and all of a sudden we heard the big 8-inch guns start firing. I was wondering why they were using them as the Jap ships were nowhere near us, and I later found out that they used them to make splashes to try and throw off incoming Jap torpedo bombers. Shortly after that we hear the 5-inch guns open up, and there was one of those right outside radio, it was manned by Marines, and it was loud as heck. Soon we hear the 1.1's start going off, and then the 20-millimeters because they're getting closer and closer and all this is really loud. Soon the .50-calibers start firing, and they're not so loud. Then I think, 'Whoa! They're really close!' By the time the little water-cooled .30's started shooting we're thinking 'What the Hell is going on here? How close are the Japs gonna' get?' So we had this little porthole in radio that opened up to the outside, and one of us opened it up. He looked out and said 'Yup, the carrier's still there!' and shut it. I think we opened it up two or three times, and each time the carrier looked okay." He paused for a second. "And that was the Battle of Midway for me." I almost started laughing at my ignorance. It wasn't that the guy was losing his memory, it's that the most memorable experience for him was just a really loud (and I'm sure pretty frightening) ten minutes or so in the radio shack. I don't think it hit me until just before dinner time that night what I had been witnessed earlier that day. I wonder how long he had kept that story, when was the last time he told it, if at all. And even though we look at Midway as this great and inspiring epic (which it is) it is still the sum of thousands of individual experiences, from the radioman who looked out the porthole of radio central while the guns blazed to the pilots and air crews that delivered the fatal blows to Kido Butai to the petty officers who strained their eyes staring at the endless surface of the Pacific trying to find the ones that didn't make it back "home". Every one of those experiences counts, and every one should be treasured. I consider it a gift to have been told these stories. I love the great age of fighting sail. I love to brew beer. I made this blog to document the resurrection of my home brewing hobby and drone on about my love of naval history and square-rigged sailing. I am far from being an expert brewer, I'm a complete amateur when it comes to sailing, and I don't have a history degree...but this is a blog, not a text book, so why should that stop me? Thanks for coming, please leave a comment and tell me what you think. Notes: Approx. 4.8% ABV - FG is a bit high for the OG. We'll see how it tastes. Notes: Approx. 7% ABV. Good body, good bitterness. In short, this one looks like a keeper. Notes: Completely on a lark. Med-low bitterness and aroma from noble hops. Boiled with (blood) orange zest. Secondary fermentation will be with 6 8 lbs of pureed mango. Beautiful amber-copper color so far. 5.6% ABV at the time mango was added; accurately determining final ABV at bottling will not be possible, so I won't bother. Two Beer Queers: We're Not Gay, But We're Homo For Beer!